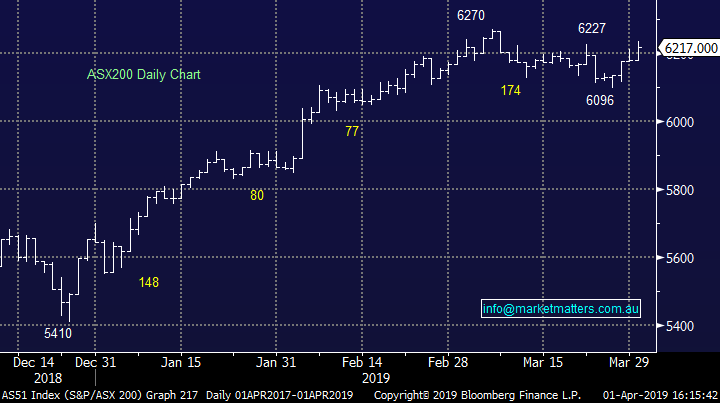 The local market ran with the positive lead out of the US and Europe on Friday night, combining with some better than expected China PMI data to send the index over 6200. The unofficial number out over the weekend was better than expected, then official, or Caixin PMI once again shown its resilience after each dip below the even 50 mark – after spending 3 months below the level, just missing out last month, today it smashed expectations at 50.1 by printing 50.8. today’s official print actually coincided with some profit taking this afternoon, with the market drifting into the close. Around the groups the REITs took a bit of a hit as investors moved up the risk curve. We also saw a slight expansion in yields which lowers the attractiveness of the sector. 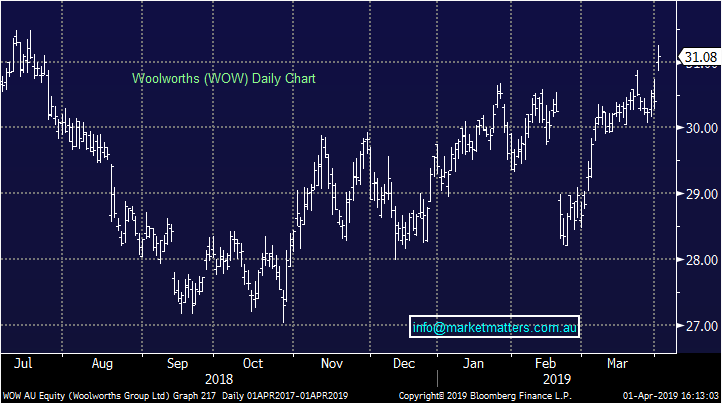 Consumer Staples rallied the most thanks to a big buy back from Woolworths which was launched today – we discuss more in depth below. Iron ore names received another boost today as the red dirt traded higher over the weekend. 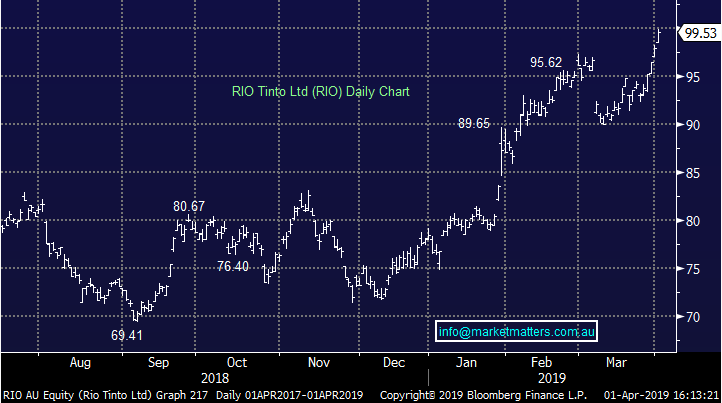 Rio Tinto (RIO), +1.65%, disclosed the extent of outages caused by last week’s cyclone, signalling they expect iron ore shipments to come in at the lower end of previous guidance of 338m to 350m tonnes. This equates to around a 14mt impasse from the fire at the facility in January combined with the cyclone. Fortescue (FMG), +4.5%, hit a new post-GFC high once again today thanks to the iron ore move. It came within a whisker of $7.50 before some profit taking saw the stock slip. 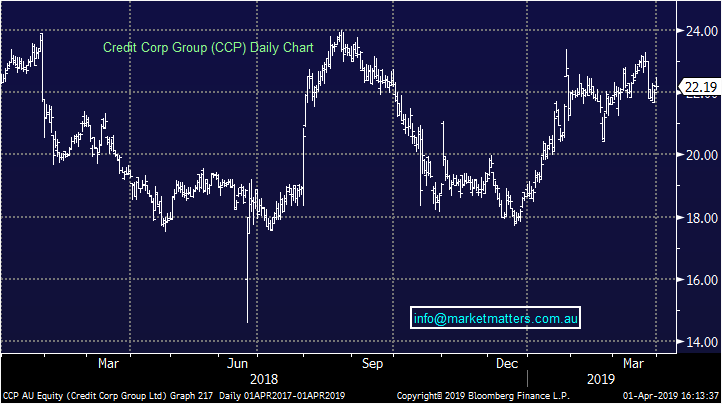 Credit Corp (CCP), unchanged today as it remained in a trading halt for the session. The debt collection company has announced it is launching a capital raise for around $110m to accelerate its debt buying plans this year while also maintaining balance sheet flexibility by reducing gearing to ~20%. The deal will be done at $20.45, ~7% discount to the last traded price on Friday. We spoke about Credit Corp recently, saying the business continues to operate strongly and we weren’t overly concerned about the Chairman selling a $700k parcel of shares and maintain that view. 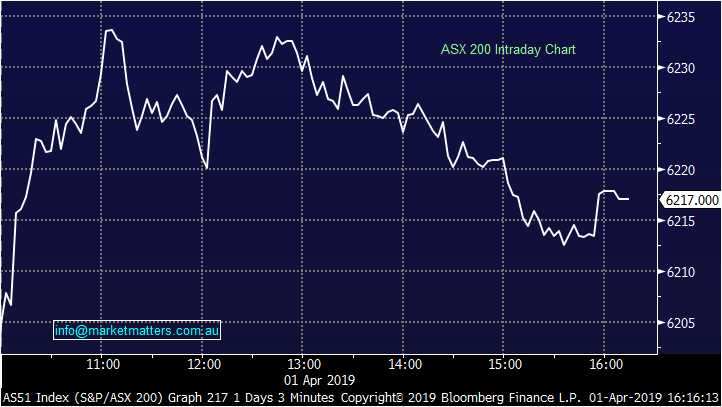 Woolworths (WOW), +2.24%, shares rallied today after a delayed start on some mixed news out to the market. The supermarket has successfully sold its petrol business to UK petrol retailer EG Group for $1.7b as was flagged late last year. The petrol business contributed $84m to the groups EBIT in the first half, around 5.5% of Woolworth’s total. The company has always maintained the proceeds would return to shareholders and today that promise was kept as Woolworths launched an off market buyback. The company stated that a number of options were considered, but specifically noted the ability to release a portion of its large franking credit balance through the off market buyback as key in its decision, particularly ahead of the likely incumbent Labor party’s franking cash rebate attack. Along with the petrol sale and buyback announcement, Woolworth’s also published the review into its discount department store Big W in which it identified 30 stores for closure over the next three years. Big W has been a thorn in the side of WOW. Big W has recently seen LFL sales do well, adding 6% in the 3rd quarter, however they have struggled to convert that into earnings and the business is expected to post a loss for FY19 of between $80-100m compared to a FY18 loss of $110m. To put it in perspective, 30 of over 180 stores will be closed in the period, as well as 2 distribution centres. We remain negative Woolworths expecting competition and inflation to punish margins.